Is the Geeks on Tour DVD Broken? The latest Windows update that has recently been installed by lots of computers included a change to Internet Explorer 9 that makes the links in our ‘Show Me How’ DVD unusable. We have searched and searched, but have not found a fix to the IE9 problem. It works just fine if Chrome, or Firefox is your default browser program. But if Internet Explorer 9 is your default browser, then, when you click on a topic from our DVD it just opens a blank screen. We are searching for the exact cause and cure, but so far are coming up short. Hopefully we’ll have an update on this soon. Meanwhile, if you use Firefox, or Chrome as your default browser – the disk will work just fine. You might wonder, ‘What does my Internet Browser have to do with playing the disk?’ It’s true, you do not need the Internet to watch the videos on the disk. But, the disk’s menu is created using HTML, just like web pages are, so your Internet Browser software is used to make it work. If you download either Firefox (by mozilla) or Chrome (by Google), the first time you run it you should see a message to use that browser as your Default browser. Please click that … or answer Yes, or OK. If Chrome, or Firefox, is your default browser, our disk menu will work just fine! 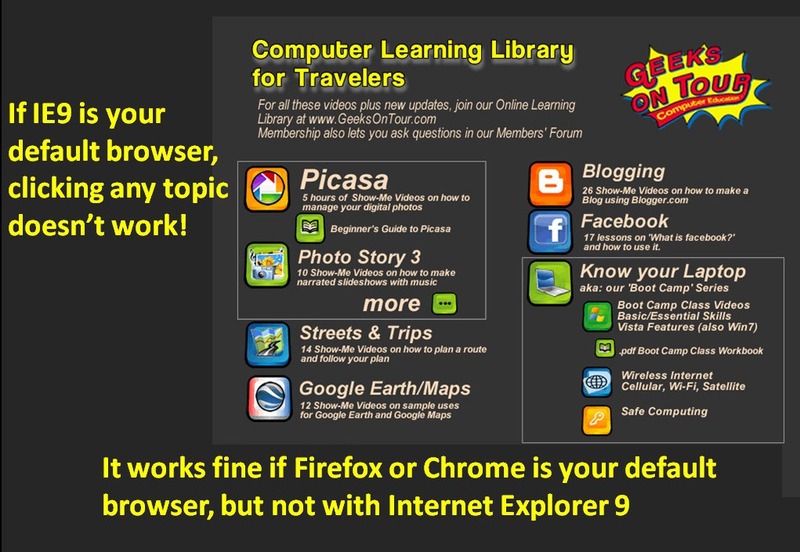 And, who knows, you might find that you like Chrome or Firefox better than Internet Explorer! Chrome and Firefox are so much better and easier to work with than IE. I recommend those out there using IE to use this as an opportunity to try Chrome if you use Gmail and iGoogle, or Firefox if you’re not tied in to Google. You won’t regret it.